Are you planning to do some remodeling to your kitchen or bathroom and would like to get the best backsplash idea that will create enthusiasm for your project? Well, glass tile backsplash is one of the best ideas that you should consider. Glass tiles are unique in appearance and offer matchless results compared plastic and ceramic and therefore ideal when thinking of an aesthetic and stylish project. Glass tiles are not only aesthetic but also impermeable which makes them easy to clean and maintain. Taking into account that backsplash tiles normally accumulate a lot of soap scum and stains, you will love the ease with which you can clean the glass backsplash tiles leaving them sparkling clean. When choosing any material for use in your home remodeling, considering its pros and cons is always important. This will help you understand how user friendly the materials could be as you use install and use them in your home on a daily basis. Glass tiles provide you with many advantages when used for backsplash. As aforementioned, glass is permeable like ceramic tiles and therefore resistant to mildew, stains and mold. The fact that you can care for these tiles stress-free makes them ideal for any project. Glass tiles are also appreciated for their reflective characteristics and therefore useful in rooms where there is no much lighting. Glass tiles tap into the little natural light entering the room making it look brighter and bigger as well. Another ingenious feature for glass tiles is that they come in a wide selection of colors and combinations that allows you to choose the best based on your project imaginations and preference. There is no better way to express your personality during the remodeling process like when using glass tile backsplash as you can play around with the different colors, combining the best designs with other features for a harmonious blend. When using glass tile subway backsplash, you will enjoy major installation advantages that cannot be compared with any other tile. Glass tiles is easy to install even for beginners. As aforementioned, glass tiles are the best and the easiest to use during your remodeling projects. This is because they can easily be match with other installations giving a harmonious match that you will enjoy. When thinking of the best glass tile backsplash ideas, it would be good to consider choosing your other installations first and then pick your glass tiles last. This will give you an easy project idea as you will manage to select the right colors and designs that will complement the cabinets, countertops, and the tiles as well. 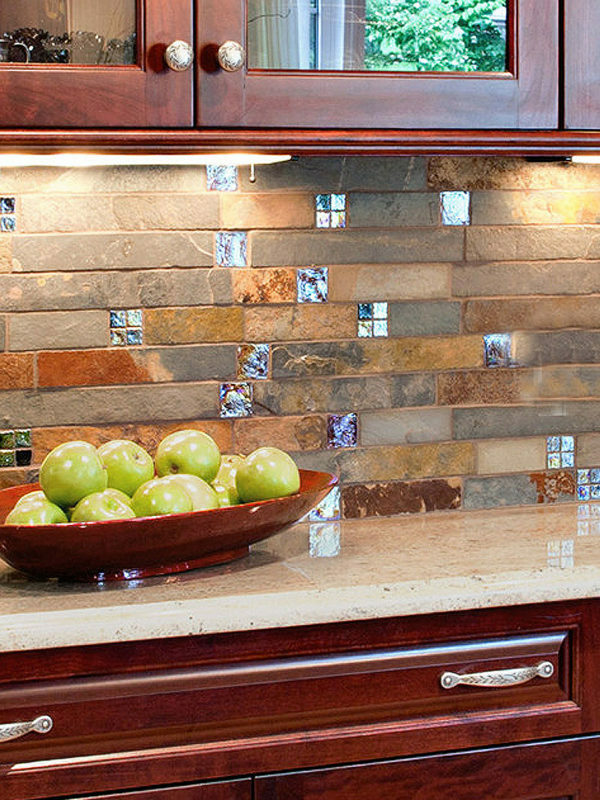 Glass tile backsplash can be very helpful when it comes to the pulling together of your project and making it work. White glass mosaic tiles have a propensity of appearing slightly green. Nevertheless, their luminosity can help transform a small kitchen appear incredible and very appealing. Another great idea is in the use of round glass tile insert. This idea has a natural look that is both silky and eye-catching. The tiles are ideal for an aesthetic home as they create a visual texture in the room making the design realistic and perfect. As mentioned earlier, there are hundreds of glass tile designs, which you can apply for your backsplash. Taking time to look at most of them will help in coming up with something spectacular and long lasting. You make glass tile mosaic backsplashes in a number of shapes with each shape offering you an extensive selection of color combinations ranging from translucent tiles to solid colored tiles. In addition, other tiles have every color shade that you can imagine. You can check at the different samples available before settling on one specific color and shape with the help of your cabinet and countertop color combinations. Additionally, the process can be easier using 3D design tools available from the tile dealer. Apart from making kitchens and bathrooms more functionally, glass subway backsplashes normally help in transforming dull and old homes giving them a new face. These tiles are ideal for the kitchen’s sink areas, giving the kitchen a modern look. This is doable in a wide selection of colors including opaque, which gives the room a feel of being larger that it is. The opaque looking glass tiles are suitable mostly in small rooms where you would want to create an impression or space. Additionally, you can use a different style mixing glass subway tiles in an assortment of colors to give the kitchen a more eclectic modern look. This style is suitable for large and loft kitchens. The choice of the right glass tiles is important and wall glass tiles are normally thinner than those used on the floor. As aforementioned, glass tiles come in a wide range of beautiful colors that make it easy for you to design your project without hassles. However, some of these colors are more popular compared to others and knowing the right color for your project is always important for the project outcome. Some of the most popular colors include black, brown, cream, green, gray, clear, blue, yellow, and white. The awesome thing with glass tiles is that you can combine different colors to come up with your desired style. For example, many homeowners easily combine black and white tiles and this creates a nicely looking effect on the walls unlike it is the case when using a single color. However, your other installations will help you design your own project for a harmonious outlook. To install your backsplash, you will need to have the right tools and materials including thin-set, polyurethane, un-sanded grout, and speed square. Start by planning your tile layout, taking the measurements depending with the desired size of the backsplash. Once you do this, mix the thin set mortar, and apply according to the directions given by the manufacturers. Make sure that mixture is as thick as creamy peanut butter. Apply thin-set on the marked wall space using a trowel and maintain the right depth. Start putting the glass tiles on the thin-set, covering 2-square-foot area at-a-time. Make sure that you have a wet sponge to clean the tiles as you go on. Surprisingly, glass tiles are very popular for kitchen and bathroom backsplash designs due to their versatility, durability, and easy maintenance. Glass does not disfigure or scratch easily contrary to common perceptions and therefore is a very suitable material for the regularly utilized spaces. This however does not mean you should use highly abrasive materials or exert severe pressure, as this will damage even the toughest of materials. Taking proper care of the tiles is therefore important, as this will help ensure that they last for long and in a perfect condition. Mix some water and soap in a spray bottle. You can also mix water and vinegar if you like as this is good in killing bacteria that could easily grow in damp places like on the backsplash and also allow vinegar to break soap scum and hard water buildups. Saturate the backsplash with the mixture by spraying it evenly. Once this is done, use a soft bristle brush or sponge to clean the grout. Splash clean water on the glass tiles backsplash to rinse them well and then wipe with a dry and clean soft piece of cloth. This will help avoid any streaks or water spots. It is that simple to clean and maintain and does not give you headache and this is what has made glass tiles a favorite for many people in backsplash installation. With these few steps, you enjoy a truly appealing focal point in your room as you also enhance the functionality of your kitchen. Always remember, choosing the right kind of glass tiles will guarantee you a highly appealing kitchen backsplash and a harmonious blend with other choice installations. This entry was posted in BLUE, BRICK, BROWN, GLASS, GLOSSY, GRAY. Bookmark the permalink.